The land price includes escorted transfers, private trek with professional guide, entrance fees, selected category of accommodations, gourmet cuisine (see details), all transportation, and travel insurance for guests through the age of 59 years (over that age, there is a supplementary fee). All prices are per person based on two people sharing a guest room. For a detailed description of our services, see Opulent Itineraries. 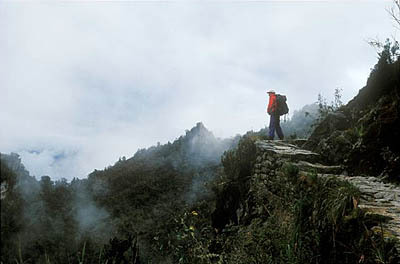 The Royal Inca Trail, or the Purification Trail, is believed to be the ceremonial path that the Inca ruling caste used for ritual purification before entering the sacred site of Machu Picchu. It allows a taste of the Inca Trail without days of hiking and camping. We begin the hike from the train stop at Kilometer 104 and follow the trail for six hours to the spectacular view of Machu Picchu from Intipunku, the Sun Gate. 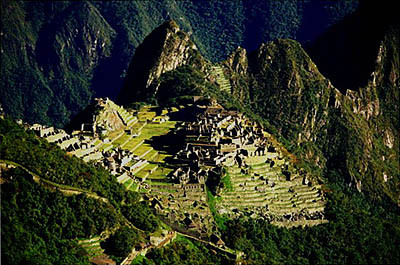 From here, we descend into the world-famous "Lost City of the Incas". After a well-deserved night in the Sanctuary Lodge, next to the ruins, we see the citadel at dawn in perfect morning light, then explore the temples and terraces until our mid-afternoon return to Cuzco by train. 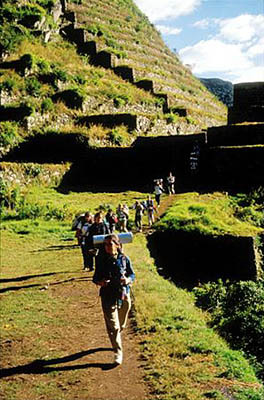 The trek is with a private guide, who will accompany you on the morning train from Cuzco or Ollantaytambo. A list of what to bring and a commentary about the archaeological sites, landscapes and nature appear in the Pre-Departure Information. From the hanging bridge over the Urubamba River, the trail rises some 80 meters toward Choquesuysuy. Continuing along the so-called Purification Trail, we followed the sound of rushing water toward the Quetzal Falls. About 100 meters higher up, supporting ourselves on the ancient, sturdy retaining walls in the midst of an amazing cloud forest, we found that the falls plummet more than 60 meters. When we were just short of the mouth of the falls, a golden-headed quetzal swooped down only to peel off an instant later, tearing at the air in the narrow gorge. We tried to imagine why the ancients chose this spot to build their Purification Trail. Some holes in the rocks serve as granite steps that take the breath away as they lead along the very edge of the water: it is the continuation of the Wiñaywayna trail, which is behind the falls. -- Antonio Martinez, Rumbos Magazine. Since its discovery, this Inca Purification Trail (Choquesuysuy - Wiñaywayna - Machu Picchu) is considered by both locals and outlanders as the principal historic entrance to the sacred city of Machu Picchu, a necessary step to cleanse the spirit. Visitors cannot help but be impressed by the five massive water fountains (paqcha) at the base of the archaeological complex. They are believed to represent the first cleansing before reaching Choquesuysuy itself. Researchers believe it is possible that offerings were left here. Archaeologist Julio Cordova, of the San Antonio Abad National University in Cusco, says the many strange and one-of-a-kind stone circles in Choquesuysuy could be sites where the ancients spent the night awaiting the sunrise. Each could represent an important resting place for the residents of above (hanan) and those of below (hurin). The fact that the circles are oriented toward the rising sun in the form of a several-storied altar confirms their purpose: purification. The entire complex is geared toward this singular spiritual event. Day 1: Cuzco - Orient-Express Vistadome - Royal Inca Trail (Chachabamba - Choquesuysuy - Wiñayhuayna - Machu Picchu). Transfer to the train station to meet your guide. Vistadome train from Cuzco or Ollantaytambo to our trailhead at Km. 104, where we begin our hike at the Inca site of Chachabamba. We start the four-hour ascent that will take us to Quetzal Falls and Wiñayhuayna (Forever Young), the largest and most exquisite of the Inca Trail sites. In the afternoon, we follow the last stretch of trail. Suddenly, we cross the stone threshold of Intipunku (Sun Gate) and encounter an unforgettable sweep of natural beauty and human artistry -- the magical city of Machu Picchu. Dinner at the hotel's Tampu Restaurant. Overnight in the Orient-Express Sanctuary Lodge. 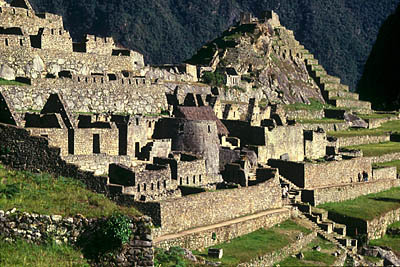 Day 2: Machu Picchu - Orient-Express Vistadome - Cuzco. Ascending Machu Picchu for sunrise, we begin a day of both guided and individual exploration. Lunch at the hotel's Tampu Restaurant. We descend to the station and board the train. 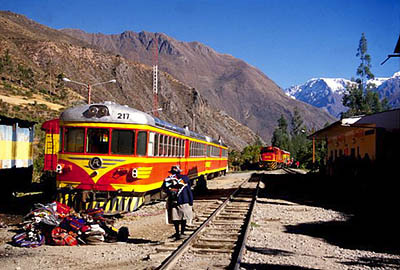 Evening arrival at the Poroy Station, on the outskirts of Cuzco, reception and transfer to your hotel. Dinner and overnight in the Orient-Express Monasterio. Day 3: Cuzco. Transfer to the airport or train station. We take the Orient-Express Vistadome train from Cuzco or Ollantaytambo, following the Urubamba River to our trailhead at Km. 104 of the railroad, where we alight and cross a footbridge to begin our hike at the Inca site of Chachabamba. 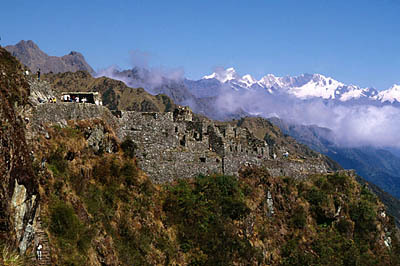 After a brief visit to this lovely ruin, with its water channels and fountains, we start the four-hour ascent that will take us past spectacular overlooks above the great valley, then below a lovely waterfall, Quetzal Falls, near the delightful site of Wiñayhuayna (Forever Young), the largest and most exquisite of the Inca Trail sites. In the afternoon, we follow the last stretch of trail across a steep mountainside, through a lush, humid cloud forest of giant ferns and broad-leafed vegetation. Suddenly, we cross the stone threshold of Intipunku (Sun Gate) and encounter an unforgettable sweep of natural beauty and human artistry -- a backdrop of twisting gorge and forested peaks framing the magical city of Machu Picchu. We walk the last half-hour or so down the royal flagstone trail, past outlying shrines and buildings, and through the heart of the citadel, before staying overnight in the Sanctuary Lodge. From its terrace and nearby lookouts, we'll be able to watch the sunset, southern constellations and sunrise over the citadel, from high above the canyon of the Urubamaba River. A gourmet dinner of Peruvian-Mediterranean cuisine by chef Huaman at the hotel's Tampu Restaurant. Overnight in the Orient-Express Sanctuary Lodge. Breakfast. 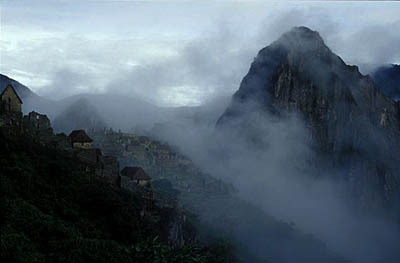 Ascending Machu Picchu for sunrise, which due to the high, surrounding mountains does not occur until around 7:00 am, we begin a day of both guided and individual exploration, visiting the best-known features of this astounding and mysterious Inca settlement. 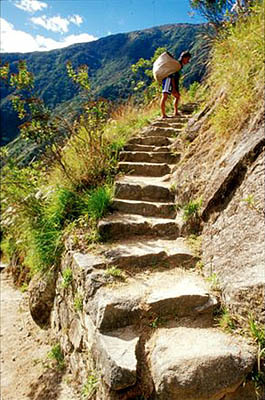 One memorable possibility is the steep trail to the top of Huayna Picchu (Young Peak), a strenuous, two-hour round-trip. Other trails lead to the Temple of the Moon (a moderate, four-hour round-trip), the Inca Drawbridge (an easy, one-hour round-trip) or Machu Picchu's multitude of hidden nooks and crannies. A lunch by chef Cáceres at the hotel's Tampu Restaurant. After a full-on experience of this glorious monument to the Inca achievement, we descend to the station and board the train. Evening arrival at the Poroy Station, on the outskirts of Cuzco, reception and transfer to your hotel.A dinner of inspired dishes influenced by French cuisine and created with local produce of the highest quality by executive chef Federico Ziegler at the Restaurante El Tupay. Overnight in the Orient-Express Monasterio.